I recently helped a customer solve their printer problems. Originally they were using an ink jet printer connected with a usb printer cord. They were having problems printing from multiple laptops. Because the printer was physically connected to one computer they have trouble sharing it with the other computers. They were also complaining about the cost of ink which kept drying out if not used frequently. I recommended the use of a wireless laser printer. This way the printer could be connected to the router instead of a single computer. 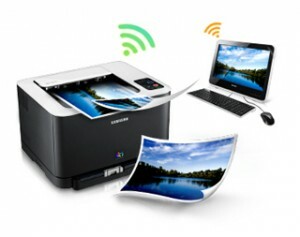 The advantage to this setup is there is no networking needed and both pc, mac and tablets could easily print to the printer. Laser printers also do not dry out if not used frequently and are much less expensive per page. A few days later I returned with a new wireless laser printer. I configured their settings and connected the printer wirelessly to the router. After running the install software on each computer they were able to print without any cables connected. They could also hide their printer in a different room if they wished. Now they could print from any room in the house. I highly recommend setting up a printer directly to the router when possible.